So today was a big day in the Jonas World as the release of their 4th album happened. They swept iTunes again reaching number #1 in record time. I have no doubt that you will love this CD. Lines, Vines, and Trying Times is by far my favorite Cd so far of the Jonas Brothers. This is a Cd that not only proves that they boys are growing up, but proves that they are doing what they love and producing a wide variety of music. This Cd has everything from crooning love song *Turn Right* to sad beautiful mellow song *Black Keys* and blast on the radio songs *Fly With Me*, Songs with a country twang to it *What Did I Do To Your Heart*, and more! The Jonas Boys have a sound for everyone. Their song Much Better gives off an 80s vibe and the song Hey Baby gives off an oldie type vibe as well. There is so much variety I just couldn’t help but beam as the songs changed. By the end of the day my cheeks actually hurt from smiling so much! Their voices are also growing and mixing very well! I was happy to be able to pick out some Kevin Jonas in a few of the songs. And the strings on the Cd are amazing as well. They do a great job and mixing instruments. Nick even plays the Glockenspiel in a song! Crazy! This is a Cd about growing up. Mostly about the pains of growing up. Complications in life and love. It’s Cd about strength and hope. Great Job Kevin, Joe, and Nick for making another wonderful piece of artwork. We love you and encourage you to keep doing what you love doing! You are great at it. This is the title of the new Jonas Brothers Cd that comes out Tuesday, Tomorrow, June 16th. I will post a review when I get it, but hear me out. I’ve been thinking a lot lately. The past week or two have been stressful and emotional. Though I have made a break through. IN essence, growing up. We all experience lies, things that hold us back, and trying times. While the title may sound redundant it’s very reflective of life. I’ve been experiencing these so called “growing pains” and I realized that I just need to make decisions and settle down. Yes, I’ll be doing it alone and we all know that I have a fear of being alone, however, this is no different than anything else I’ve done before in my life. I just need to go and do it. There is a line in one of Kenny Chesney’s songs that goes like this: I knew I could never hold that girl, she was born to see the world. Well, as much as I want to stay at home and be with my family, I can’t. I know where I belong and what I need to do and it’s not going to happen in Philly, the subburbs, or in PA. I need to move. I’m just scared. Moving, alone, means starting over completely. In a new state, a new area, far from home…yes 15 hours by car, 2 by plane. Florida. Disney World. August is my deadline. I have until August to figure out if moving is the right thing for me. A mid-July trip to Orlando and the surrounding area is the perfect way to scope things out and make sure. If it doesn’t work out, well I can always come home and try again. Another thing that’s been bugging me is that I really don’t see people. The one person I thought I would see a lot of, I’m not and it stinks. It turns out that this person is apparently, according to them, is not the person whom I thought they were. This person no longer calls or cares I guess. Which is fine since this person is moving far away at the end of the summer. To be honest, I saw this coming. I just was sort of hoping this person would prove me wrong or would be different than everyone else I know. But disappointment is never far away. I haven’t really been social because there is no one around here. But this does open up time to read, write, learn guitar, and so on. I’m not depressed or upset about what has been going on this summer. Yes, it gets stressful and frustrating with my parents and the job thing, but I’m content. I love being here and just relaxing. I need this, for my health and sanity. I like to ease into things and this is the perfect way to do that. I have the rest of my life to work. I’m still young and a knockout (personality wise). 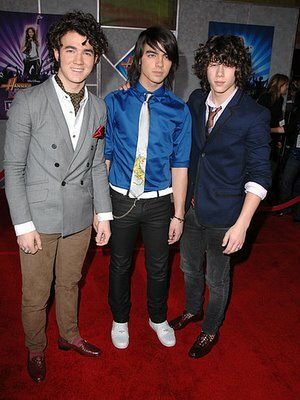 A lot of people understand me, no one will ever understand my obsession with the Jonas Brothers, but I could care less. I am who I am. And my obsession with the Jonas Brothers is because they are a group of great musicians with good heads on their shoulders. One day people will see that. Half the time, if people didn’t know the Jonas Brothers were singing a certain song, people would like their music. I’ll get on that soapbox another time. But life is life and I am excited to listen to Paranoid and Fly With Me all the time as well as the other music that will help me get through my own Lines, Vines, and Trying Times. Hey All! Tonight I want to talk about my favorite boys. First off: The premiere of their music video for Fly With Me was on the Disney Channel tonight. Even though the video wasn’t flashy or have a cool story-line and looked like it was made during their rehearsals, it was amazing! I think that it was perfectly Jonas Brothers. The video was exactly who they are. It was relaxed and fun. 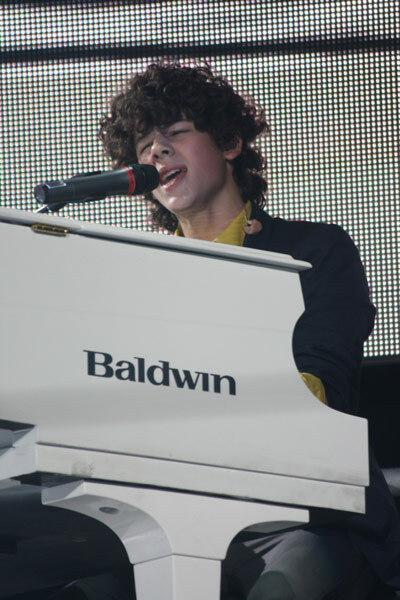 Joe’s facial expressions, the behind the scenes clips, Nick at his white piano, it was perfectly Jonas. I like how they let us in on the work they are doing for the tour. To see the turn table stage in action was amazing and really really cool. I really liked the video because it reminded me why I liked the Jonas Brothers to begin with. Their music is amazing, they are extremely talented, they always want to go bigger and better in bringing their work to their fans. They are simple, fun loving guys who happen to make music we all can relate to. They have family and friends who love them and support them. Yes, they draw crowds and attention, but for three young guys in an EXTREMELY loose entertainment business, they seem to have their heads in the right places. Someday I hope to meet them *away from the crowds maybe* and find out for myself that they really do have their heads on straight and that it’s not all the Disney Giant speaking in-through them. They are boys, they are young men in a very VERY fast paced world and they will fall because they are not perfect, but they will get back up and learn. Just because they are in the public eye all the time doesn’t mean they are exempt from making mistakes. They are doing the best they can with the lives they have been given and while I don’t know from experience, I can guess that being in the light all the time is not an easy job. So thanks again boys, for doing what you are doing! You are amazing young men *even the Frankster* and I think that you guys are on a great track. Thanks for being an inspiration to us all! Thanks for creating a family out of your band and not just be the Jonas Brothers with some back up band…thank you for being The Jonas Brothers *including band and all!*. Just remember that you have all of us fans out here supporting you as well. You treat us great and for that, I respect you guys more than I respect any other celebrity! A Quick Shout out to Mr. John Taylor who made his TV debut tonight on JONAS! You did a great job John! Hope to see more of you and the band the rest of the season! I can never justify paying for movies these days. $10 is crazy let alone the costs of snacks. Today I payed $7 just for a medium sized bag of movie popcorn…next time I’m popping my own. On top of that the IMAX movie costs $15.50 for adults and $12.50 for kids. Really? $28 for a movie? Going to the movies has become a luxury item these days. I remember when you could get in under $5. These days, the movies are rip offs, especially if the movie stinks. I realize this movie has gotten a lot of mixed reviews. I read one today that said that the actors were horrible because they seemed to be looking at nothing which, for the most part, is what they were doing because when they were filming half the stuff wasn’t really there. However, I would beg to differ. I will admit that I hated parts of this movie. But the majority of it I loved simply because it served its purpose. For the hour and forty five minutes this movie ran, I actually was able to let my imagination wander on the thought of a museum coming alive. I found this an extremely interesting thought. I also am a fan of movies that teach life lessons, even if it is cheesy. This life lesson: Do what you love with people you love to do it with. J.M. Barrie hit the nail on the head when he invited kids to see a performance of Peter Pan, knowing that the adults would not be able to appreciate it without being able to see the show through the eyes of a child. Sometimes I think that movie critics need to remember this. Of course you wouldn’t like it if you knew all the magic behind the movie and scrutinized every movement of the actors. Relax and watch the story unfold. Learn to laugh and open your mind up. Take a child with you for crying out loud. True, this twenty-something-year-old girl would have liked the movie even if I went with friends my own age, but that’s because I have the mind of 5 year old. I love to believe in magic. But sometimes I think we miss the purpose of things. The purpose of this movie was to entertain. It was to make us laugh and let our imaginations run wild for a little bit. It wasn’t meant to mirror real life. Therefore, I give this movie 4 out of 4 stars. I could have done without the love story, however, Amy Adams was great *she always is*. I also loved the appearance by the Jonas Brothers as Cherubs. They were even able to sing a little bit of Love Bug. Also, stay tuned at the end of the movie for an extra little clip and to hear the Jonas Brothers song for the movie Fly With Me! Did you see the movie? Let me know your thoughts! Yesterday Nick had his 16th birthday!!! He wanted a puppy and he got one!!! THe pictures of them are so cute but I refuse to post them because I just don’t understand why he couldn’t take his new puppy out for a walk without someone taking a picture of him. Well Nick, now you can try for your driver’s license and beat out Joe. I hope this year is full of wishes and dreams come true. I know I’m late Mr. President, but Happy Birthday!! Anyways Just letting you know that the boys were there and that i missed them. I wish I was home for that though because I would have loved to see them!! I would totally buy them breakfast at the Waffle Shop!! Boys next time you go to STate College, I’ll buy you and the band and the fam breakfast at the Waffle Shop!!! TOnight I am relaxing after finishing my internship! I am trying to do my chores and make a scarf/belt for my Pirate costume for Sunday and Watch The Jonas: Live and Mobile MTV event when I stopped my world to watch this weeks LIVING THE DREAM! This weeks episode was about Nick’s Diabetes. 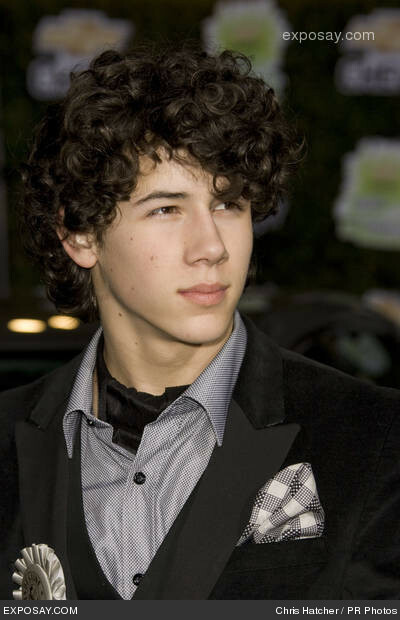 Now I have been following Nick closely because i am quite familiar with the disease. My dad has Type I and so does my aunt. My dad has had a lot of attacks and it can get really scary. I can relate on some level with Nick because I have a type of Asthma that is offset internally and externally (allergies). I’ve had my run hooked up to hospital machines. Nick has inspired me to educate others about asthma and I am creating a website and I hope to speak out about it some day. While I don’t have the “star” power NIck does, I can still be an advocate! I have no one to look up to. As far as I know, I’m the only one of my friends *besides my brother* who has asthma. It can be hard. Anyways so the Brothers got raw with us about NIck and his condition and I guess it just hit home. There’s a part in the segment where Nick is talking to two really young kids who have pumps and I got really emotional. My dad now has a pump. Anyways, Nick kneeled down to this little girl and said “I’m here for you. Everything is going to be alright” and he grasped her hand. I was like awwwwwww.